This article addresses the specific use case of needing to monitor a web page's meta description for changes as there are some specific nuances for this requirement. For a complete guide on how to monitor specific or select HTML elements, you should go HERE. There are two common issues that can occur when monitoring a webpage's meta description for changes. This will review those as well as provide you a means for testing that you've set it up properly, irregardless of the issue. So, if you're following our guide to monitoring for changes to specific HTML elements and copying / pasting the meta description from the web page's source code, it will not work and you have to take an extra step to delete that "slash" while keeping the end bracket in place. 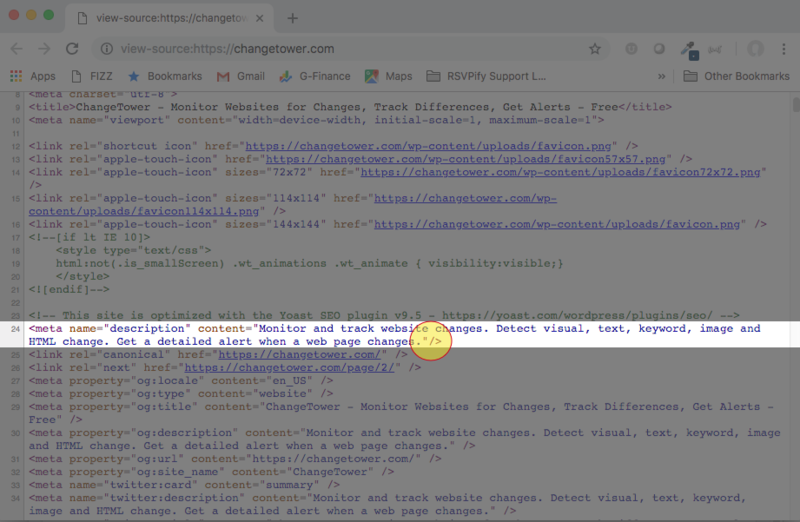 Solution: the safest way to ensure that your Monitors are going to run properly and alert you of changes to a URL's meta description is to copy it from the HTML captured by ChangeTower during the initial crawl.